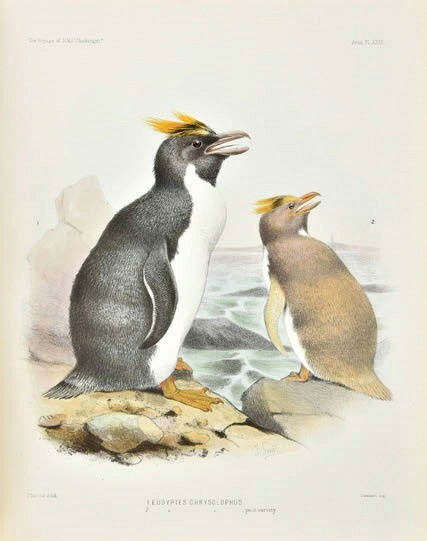 Eudyptes Chrysolophus, or Macaroni Penguins is one of around 3000 plates from a set of the official report on 'The Scientific Results of the Voyage of HMS Challenger during the years 1873-76 in Atlantic, Pacific and Antarctic seas'. A largely complete set sold for £11,000 at Dominic Winter. Sold for £11,000 by Dominic Winter (20% buyer’ premium) on April 10 was a largely complete and handsome set lacking only six of the zoology volumes. Eudyptes Chrysolophus, or Macaroni Penguins, above, is one of around 3000 plates, charts and maps, mostly lithographed and in many instances coloured or tinted found in an incomplete set from the library of the Faculty of Physicians and Surgeons in Glasgow.